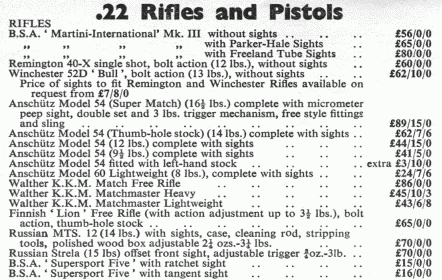 Below are 1963 prices for comparison with other rifles of the day. 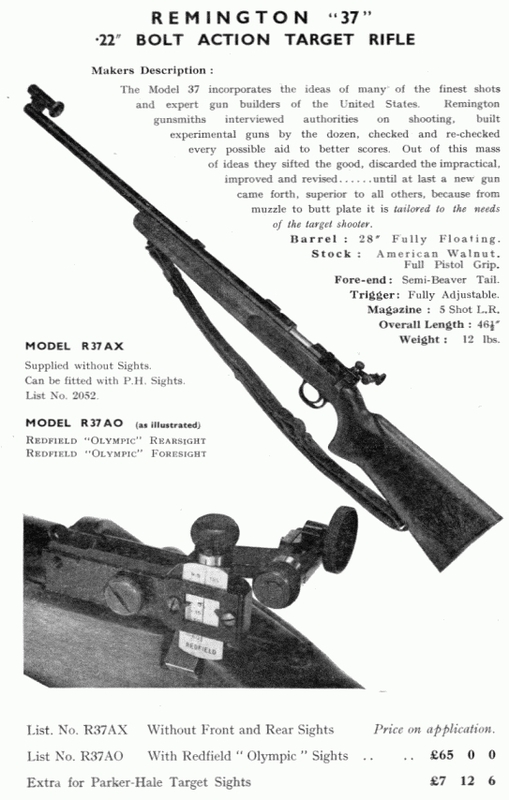 Thanks for buying the Remington Model 37 brochure. I'm surprised you didn't also buy the early one, too. It pictures a version that was a prototype but was never sold. Apparently they made up the brochures before the final engineering changes were made. The one pictured is the prototype, and the change made before production began was the removal of the band around the fore stock and the little tongue of wood that it encircled. Because I had lovely examples of both the 1937 version and the reworked 1940 version, I decided years ago to try and find one of the prototypes made up in 1936 for trials by competitive shooters. The legend was that 30 or 40 were made up and loaned out for trial and feedback. The feedback was - GREAT RIFLE BUT GET RID OF THAT LITTLE TONGUE OF WOOD AND BARREL BAND. So, that's what remington did. 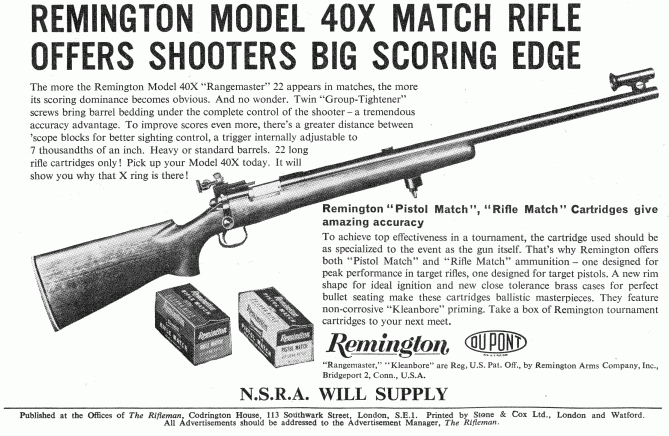 I had seen pictures (Remington advertisements) of the prototypes in the hands of shooters in two 1936 issues of American Rifleman, so I knew the rifles had existed at that time. After years of searching, I finally found one. Two friends (and fellow Remington collectors) were writing a book entitled REMINGTON .22 RIMFIRE RIFLES, and when I told them I had a prototype Model 37, they asked if they could photograph it for their book. 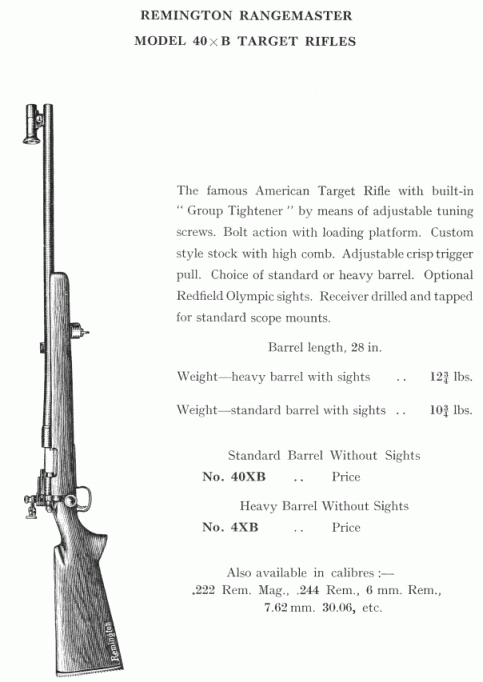 I have the only known example except for the one in Remington's R&D Museum. No one I have ever met or talked to has ever seen one. Many doubted there ever was such a gun. My search was fueled by the fact that they couldn't take pictures in 1936 of guys holding them if they had never existed. Since one of the authors lived less than one hour from here, we decided I should bring all three of my 37s, and he's photograph all of them, and I would be the entire M37 chapter! It turned out great. The early brochure did NOT receive a bid, and that auction ended. If you decide you want it, it's yours for the opening price of $29.95. I'll mail that auction to you so you can see it. Good morning. I put the 2 Remington 37 brochures on top of your package. I'd already made up the package with the BSA catalog in it ready to mail. I'll open it and put the 2 Remington brochures in it, and, if you win the British shooting club booklet, that'll go in there, too. The first 4 attached pictures are of the boxed deluxe copy I have of Roy & John's .22 Remington book. The next 6 were taken at Roy's house the day he took all the pictures of my Model 37 collection while he and John were working on the book. Roy Marcot is the shorter of the two authors, and he's the one who lives nearby in Tucson (about 24 miles from here), and he is the "unofficial" Remington historian. He is the author of several gun books, and he is currently in the process of writing 3 more. Roy and I have become good friends, and we see each other at least once a month. John Gyde lives in Oregon, and he is a banker. His main collecting interest is .22 Remingtons, and MANY of the rifles in their book are from his collection. All the pictures were taken at Roy's house in Tucson. As far as high-grade .22 target rifles go, I have the three Model 37 Remingtons, and I have four Winchester Model 52s; 2 Bs, a C, and a D. The reason I have 2 Bs is that one is a normal production version, and the other is a deluxe version from Winchester's Custom Shop. The Winchesters are fine rifles, but the Remingtons are every bit as good. I think it's that the 52 was in production for about 15 years before the 37 showed up. By then, the Model 52 had such a high (and deserved) reputation that a lot of shooters didn't bother giving "the new guy" a look.